This is the only coastline in Britain designated a National Park because of its spectacular scenery. 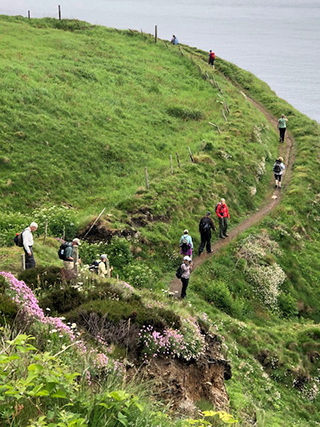 Passing by rocky coves, sandy beaches, and small harbors, our coastal path hugs the cliff tops and provides wonderful views. We shall see many seabirds, and possibly a few of the Atlantic Grey seals. 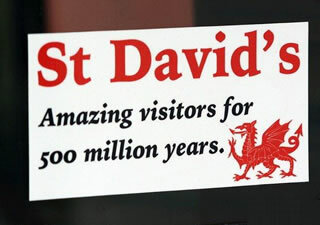 If your interests include history, there will be a guided tour of St. Davids Cathedral - Wales' largest. Along our walks we will see the ruins of small chapels, hut circles, Iron Age forts and a Neolithic burial place. 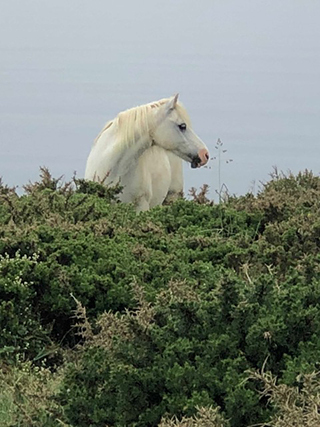 Our hikes average 8 miles and are at a pace which allows for photography, contemplative viewing, time to ask the guide questions and maybe some Welshcakes along the way. 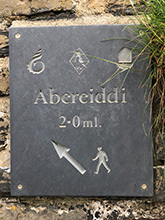 At the end of the day, we can be assured of excellent comfort and delicious food at the St Davids Cross Hotel, our base in the heart of the village of St. Davids. 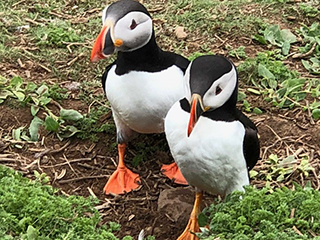 Tuesday, June 18 - A day on Skomer Island, a British National Nature Reserve managed by the local Wildlife Trust where half a million seabirds breed annually. Among the inhabitants here are Manx shearwaters, guillemots, razorbills, kittiwakes, gulls and puffins! 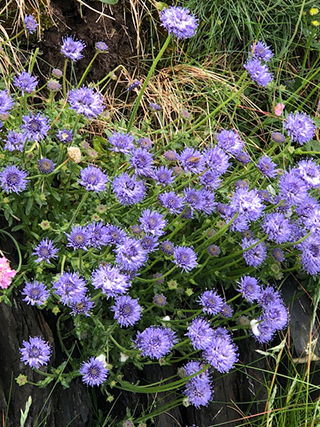 Skomer, 2 square miles in size, is a 20-minute boat trip from Martin's Haven. We will take a bus from St. Davids to Martin's Haven - 1 hour journey. Bring binoculars. 3-5 miles today. Wednesday, June 19 - Walk from the Cross Hotel to St. Non's Well and onto the Coastal Path. Our walk takes us past the shrine to St. Non (St. David's mother) then on to Porthclais harbor-William the Conqueror came into this harbor. Along the way we round the most westerly point of Wales. We will be seeing beautiful sea views, seabirds, old copper mines and earthen forts. At St. Davids Lifeboat Station we will turn away from the sea and back toward St. Davids. About 8 miles today. 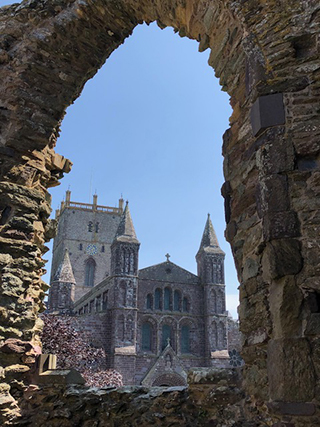 Thursday, June 20 - This is a relaxed day on your own to explore St. Davids. We will have a one hour cathedral tour in the morning (10:30). Enjoy a day of leisure to investigate the shops, read a good book, or take a walk. Friday, June 21 - A local bus this morning to Porthgain and a look around the artists' galleries there before a walk through the harbor village and onto the coast. 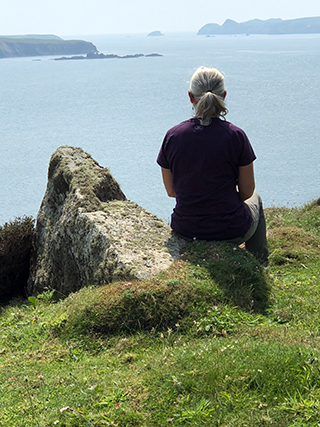 We will have wonderful views to the west as we follow the path by old quarries, (Blue Lagoon at Abereiddy), badger sites, hill forts, and gull colonies; maybe even see some seals bobbing in the water. Our path takes us back into St. Davids. Today 9.5 miles. 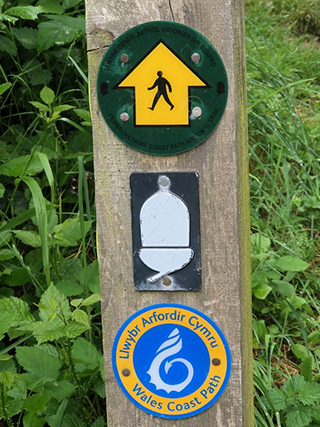 Saturday, June 22 - We will take the local bus to Pen-y-Cwm where we begin our short walk to join the coastal path. We have long views to the sea today and closer views of choughs and peregrine nest sites. Our lunch is at Solva Boat Club on the perfect harbor of Solva. 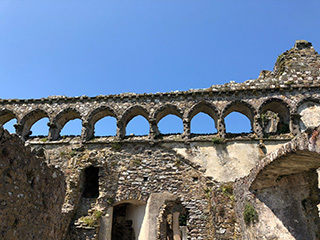 You could take a little shopping time here if you choose and take the bus back into St. Davids or continuing on the coastal path- the afternoon walk follows a varied coastline taking us by an Iron Age hill fort, lime kilns, an old mill and maybe a surprise tea stop! Via Caerfai Bay, we are back into St. Davids. Today we have a series of steep hills that have many steps--you will be using your hiking poles a lot. About 8 miles today. Sunday, June 23 - A final day walking. Our aim today is St. Davids Head. A pre-historic burial chamber, Iron Age field system and hut circles are sites we will visit on this headland. 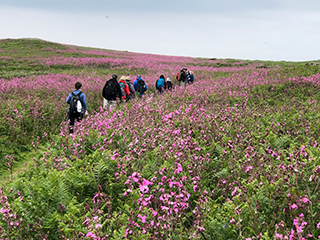 Our walk back into St. Davids will be along the mile-long beach of Whitesands Bay watching out for orchids and butterflies. Or, at White Sands Bay, you may take the Celtic Coast bus back into St Davids for last minute shopping. Today 6-7 miles. Monday, June 24 - Breakfast and departure.